Watch how this R/C Humvee seemingly defies gravity. It can drive up walls! Drive from the ground up the wall, then up and down in wild patterns. 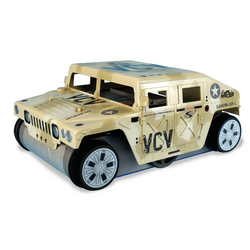 Full-function radio control vehicle features the advanced Air Venturi system that works like the air suction of a vacuum. It drives the velocity of air underneath the vehicle in order to create the massive down-force that keeps it on the wall.